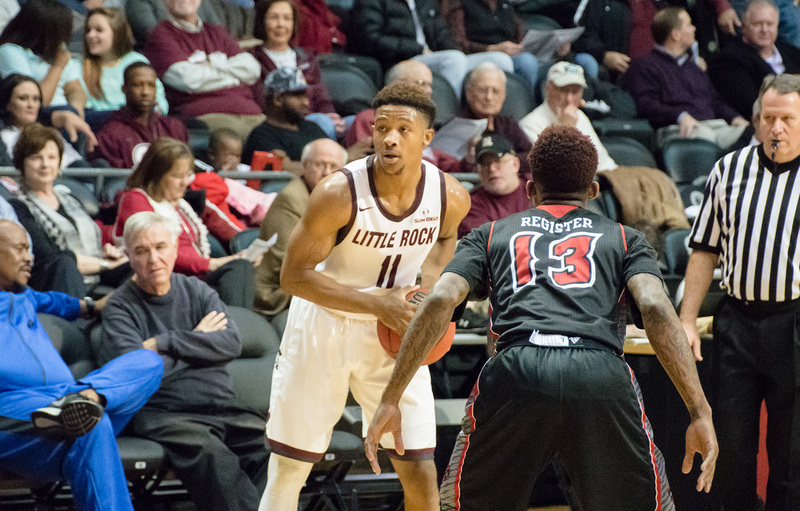 The Little Rock Trojans move to 13-1(3-0 SBC) after a strong defensive performance against the Louisiana Ragin’ Cajuns(5-7, 1-2 SBC), winning 77-57. Going into the game, something had to give, Louisiana was the nation’s 20th ranked scoring offense and Little Rock was the best defense in the country. The Trojans held the Cajuns well below their 84.3 points per game at just 57 points. Early on it looked like the Ragin’ Cajuns would have their way offensively, jumping out to a quick 6-0 lead and shooting 50% from the field. Then the Trojans quickly responded with defense to take the lead at 13-12 and forced Louisiana to just 1-5 shooting. After 7 ties 5 lead changes within a short period, Little Rock grabbed the lead for good, heading into halftime with a 34-30 lead. The Trojans quickly extended their lead after halftime, outscoring Louisiana 43-27 in the second half for a final score of 77-57. The Trojans were led by Roger Woods with 16 points and six rebounds. Lis Shoshi and Marcus Johnson Jr. both added 12 points. Josh Hagins scored 11 points while totaling seven rebounds and six assists. Louisiana senior Shawn Long entered the game as the leading scorer and leading rebounder. Long needed just 13 rebounds to tie the Sun Belt Conference’s all time record for career rebounds. The Trojans held him just shy of the record with only 11 rebounds and below his average with only 16 points. He led all Ragin Cajuns in both categories. The game was won on second chance points and points off turnovers. Louisiana out rebounded the Trojans 44-41, however the Trojans were able to capitalize off the rebounds, besting the Ragin Cajuns 14-8 with second chance points. The Trojans defense created 14 turnovers that resulted in 11 points. The Trojans finish out their three game home stand with a game Saturday against Louisiana Monroe (5-7) and Appalachian State (2-12) next Thursday. Tickets are available for both games.